"CloudShell Sandbox API and integrations with DevOps tools"
Cloud Sandboxing for Financial Services will ensure that your applications run smoothly on your large and complex infrastructure. Financial Services applications are becoming more complex and sophisticated – embracing newer technologies while at the same time having to support core services that are based on legacy and on-premises specialized systems. 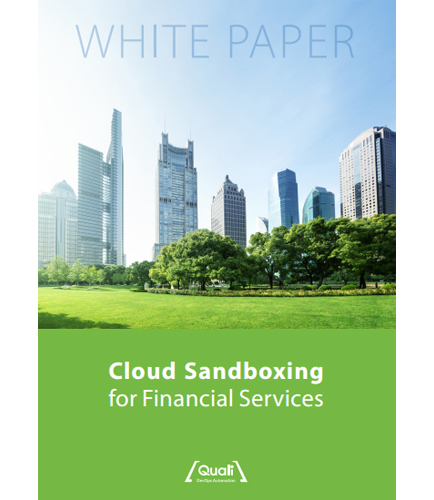 This whitepaper discusses these challenges faced by Financial Organizations, and introduces the concept of Cloud Sandboxing as an enabler for DevOps processes. How can sandboxes help you achieve faster application delivery? How do ­financial services organizations move to DevOps and deliver secure high quality applications at scale? How sandboxing provides the basis for good early application compliance security testing? Facilities managers are tasked with all kinds of responsibilities, from ensuring the look and feel of a company’s locations remains in top notch order to literally keeping the lights on. Being a facilities manager is critical to maintain visibility into all aspects of the operations, particularly from the financial perspective. This whitepaper discusses all the metrics that are the key indicators many facilities managers use to stay on top of their game. It highlights the following key questions: What are the metrics that are important for a facilities management group to track and report on to the finance group? What are the numbers that modern facilities managers share with their CFO? What financial benchmarks and data points should you regularly use to optimize performance and make smarter decisions?